That’s my grandmother’s kitchen circa 1955. I visited this house just a few times and I have but one memory. The laundry chute. You know…the one that goes from the top floor all the way to the laundry room in the basement. They didn’t have such things in the houses around us in Texas. But they had them in North Dakota! As early as the 1950s…or whenever the house was built. Want to know what we did with the laundry chute??!!?? You can probably guess. We filled up the big bin in the laundry room with a bunch of towels and sheets. Then we’d run up stairs squealing with glee and we’d drop ourselves down the chute, and crash into the big bin. Wash, rinse, repeat. I’m so grateful for my uncle, who painstakingly has uploaded and emailed all of us many of the pictures from and of her several homes. Including this photo of her kitchen. I love it. I love her kitchen. I love the look of it. I love the smells that I never really smelled that came out of it. I just love it. Do you have a favorite memory from your grandmother’s kitchen?! I love the picture and the story. I often tell my four children, 3 boys and one daughter about growing up around my mamaw’s table. Big family dinner’s every Sunday, no excuses. My 6 cousins, mamaw and papaw, parents, aunts, uncles, the whole gaggle of us. The meals that she made then are still my comfort foods today. The funniest memory is of my cousin and I always fighting over the green olives! The battle lasted years and is still a joke today. We’d sit there one eyed eye balling each other during prayer so that the moment “Amen” was said we were grabbing for the bowl. After dinner was cleaned up we would all settle in and watch Disney and Mutual of Omaha’s Wild Kingdom. I can still see and smell her kitchen. It is a wonderful thing to think about. Thanks for sharing your photo and story. I may have to go looking for some of my own photos!! I was super lucky to grow up with BOTH grandmas in town and spent plenty of time in both of their kitchens. My maternal grandma is a fine cook with many more sophisticated dishes in her repertoire, but the one we kids all loved the most is her mac ‘n’ cheese recipe which is a processed foods concoction that is “terrible” by today’s standards yet so delicious. She always made it so the kids would have something they’d like/eat at family gatherings. My paternal grandma came from Texas (we live in CO) and she could cook up a storm, canned tons of fruits and veggies, jams, made her own breads from scratch, etc. Dinner was never dinner without at least 3 side dishes, one of which was always bread. The three recipes I most vividly remember her making are fried catfish, banana ice cream (every memorial day) and her German apple pancake (the puffy kind). Amazing women both of them! OMG, I love that kitchen. 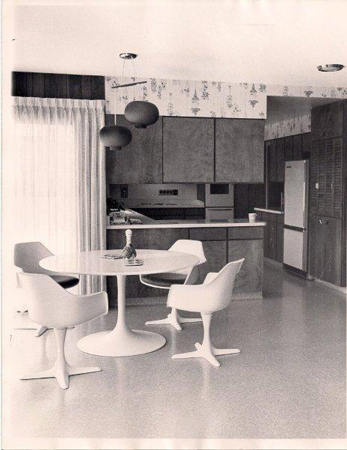 Minus the wallpaper, people pay big money for kitchens like that now. And the table and chairs are awesome. If only it was still in the family. Yes, my Grandmother’s kitchen was tiny and had a lovely little walk in pantry that also had a countertop to work breads and such on. Her kitchen was what I call Kitschy. Wallpaper and knick knacks abounded. She had a tiny little table right smack dab in the middle and it was full of love. She just loved to bake things and give them away — that was her ministry — cooking. How I miss her. That’s a Herman Miller Eames table. Very chic! Did you know that table is in the Museum of Modern Art? I know because that’s one of the pieces of furniture that my parents bought when they were first married in the 60’s. They still have it today! In fact, they custom-built a house and their kitchen has a round room in which the table sits. Your grandma was a pretty hip lady! As for me, my local grandma’s kitchen always smelled like grease spatter. It made me a little sick to my stomach (she wasn’t the greatest cook). My other grandma lived 6 hours away so I don’t have lots of memories of her cooking – but I remember her kitchen was INCREDIBLY small. Just a little box and I always wondered how she managed to get a turkey and all the fixings in that small room (we often had Thanksgiving at her house). – Just wanted to clarify that there was no sitting area IN her kitchen. We ate in the dining room! I just didn’t know how she fit all the FOOD in that little room. My grandmother’s house was next to a small lake. We all gathered at grandmother’s house on the weekend and on all holidays. We usually made dinner a family affair. My aunts and uncles lived on the other side of the lake and would bring in things they had just pulled out of their ovens. I still remember my grandmother making some monkey bread and putting the fresh made dish in front of us kids. By the time she realized it was undercooked and wanted to put it back in the oven – it was too late – it was gone. She also made a great rhubarb cobbler with rhubarb she had grown in her tiny back yard garden. I will always cherish the memories of Christmas at my grandmother’s. Fourteen of us -aunts, uncles, cousins, sisters, Mom, Dad, and Grandma sharing the holiday. Geez you’re grammy was cool! Wow. That’s some extremely awesome furniture your granny has!! My grandmother was the best cook in the world. Beginning at breakfast with her always homemade biscuits that she made on top of the stove in a special biscuit cooker. She made the absolute best meatloaf, fried chicken, salmon patties ever. No one has matched it. On Sundays, we kids would run around and play, but when we smelled the tea cooking (in those days there weren’t tea bags, you boiled tea) we knew the meal was almost ready. She would make the tea fresh with each meal and it didn’t need to get cold before we drank it. Lots of ice and it was the best tea I have ever drank, bar none. We always brought the piano bench into the kitchen for a couple of kids to sit on. Her dishes were old hand me downs but you know what, the sweetest memories of good food, a loving family and family history shared at that table are priceless. That was in the 1950s. One more memory, I used to stand at the table where she made all of her pies (three on Sundays) when my nose would just come to the top of the table and watch her make her pie crust. She would sometimes dot my nose with a floured finger and smile and wink at me…oh what sweet memories. I loved her so. Thanks for stirring these memories up and letting me share. What memories! Both of my grandmothers were great cooks and I even got to know my great-grandmother, who would never let us leave her house without a “picnic” of chicken fried steak and all the fixin’s!! Her kitchen was tiny and had metal cabinets – I’m using a new dishwashing soap that smells like her kitchen! My local grandmother had a big kitchen and an even larger garden, from which she canned all summer long – I have tons of her recipes and my husband laughs when I say, “Um, it smells like Nana’s kitchen in here today!” I have her old cookbooks, too. It’s so nice to look through them and find her writing – notes that she made about different recipes! I got to be be closer to my other grandparents while in college and I credit her for teaching me lots of what I know about cooking. Thanks for the walk down memory lane! My father’s parents lived far away, so I never knew them, and my mother’s mother was in town but they all died when I was very little. In our teen years, my sister & I decided we’d “adopt” some grandparents for ourselves – families from our church whose granddaughters lived far away. We had the best times! 🙂 It was a comfort to them to have someone close; it was a blessing to us to have someone near. Worked out for the best on both sides. Both my grandmas had small kitchens, no tables in them, but we’d go in and help cook a little when we weren’t playing and they both were/are great cooks. 🙂 I have some of Grandma Bette’s recipes, she passed right after we found out our first son was on the way, and I tell stories of her every time I make something she made. Grandma Doris still comes to family dinners on the holidays, when she’s not wintering in the southern states; it’s nice to have that connection for my kids, that sense of tradition and family. Thanks for a great topic! Always great to have your history documented with great pictures! The kitchen is such an important room and I’m SOOOOO in awe of the table and chairs, so modern! I love this picture! I have been reading your blog for over a year now and I never realized you had family in North Dakota! I grew up there and lived close to both Grandma’s… I spent more time in my Grandma Fern’s kitchen and have SO many memories and I love going back. One of my favorite things about her house is that she has a laundry chute as well, although we never had the cool idea of putting ourselves in it! Whenever we would come over, my Grandpa would be downstairs in his “man room” and we would go to the laundry chute and yell for him… he would call out to us that he was The BIG BAD WOLF and howl at the top of his lungs. Thank you so much for sharing your stories, its nice to think back to those precious memories! My grandparents divorced before I was born, but my grandad had that same table and chairs until just a few years ago when he went into the nursing home. I always loved sitting at that table playing games. WOW! Its so funny seeing that. I recently moved into an early 60’s Colonial that had never been renovated and the kitchen layout was pretty much identical. Same wallpaper – (was it gold-tinged?) Cabinets hanging down low over the island. Gives me a new appreciation of how my kitchen looked in its hey-day. We are years away from any major renovation, but out of necessity recently ripped out the wall ovens/stove top and put a pantry cabinet & traditional stove in its place. The wallpaper is being stripped down and we’ve taken the doors of the cabinets so that its not so claustrophobic in there seeing as I pretty much live in my kitchen. Just WOW!!! It was like looking into a time capsule. Snagging this picture to show to my husband. He won’t believe it! Feel free to email if you want me to send you some pictures from before we moved in. Hey just found this website,little late judging by the dates of comments on the kitchen. I am aimming for a vintage kitchen this year and this gives me ideas. I remember my grandma cooking on her wood burning stove. I wish I had that to use but we are looking for one. I can still remember waking up to the smell of homemade biscuits when we stayed. Thanks for the memories.